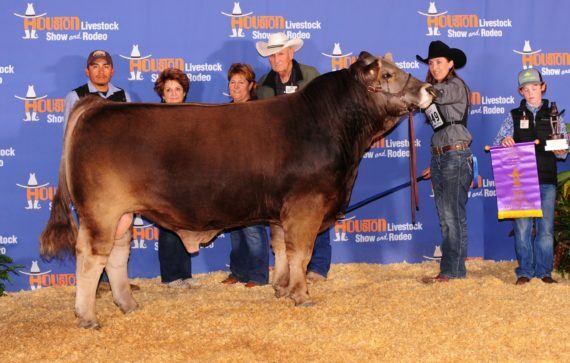 Magnum PI was the Champion Bred and Owned Purebred bull at 2014 Jr Nationals (part of Champion cow calf pair). Class winner at FWSSR (part of Champ Produce of Dam). Calf Division Champion Bull, Reserve Grand Champion Bull HLSR (part of Champ produce of Dam). Grand Champion at 2015 American Royal. Grand Champion 2016 Fort Worth Stock Show. Grand Champion 2016 Houston Livestock Show. Grand Champion 2016 Tulsa State Fair Show. Grand Champion 2016 American Royal. Grand Champion 2017 Forth Worth Stock Show. Reserve Grand Champion 2017 Houston Livestock Auction. Performance, Maternal Value and a great look make this bull a natural choice for your next AI program.